They are funny, engaged, and interested. They are incredibly grateful for the time and interactions that any volunteers bring. Just to show up, look them in the eye and shake their hand and treat them like human beings. They don’t get that often enough except with the religious volunteers. I think that attitude sets the foundation for the engagement. We develop a give and take trust that makes education in this setting possible. The topics that we touch on are the difficult topics of life transformation. We don’t talk about their crimes, they all know that they are in their for a crime, we even joke about it. Once I mentioned, “Ya, well I get to go home after this”, and they replied, “Ya, they keep us here because we are criminals”. They know that they have made bad choices. In those moments when they are calm and grounded and connected, they want to be able to make better choices and know they don’t have the skills to do that. With this foundation of trust, and give and take we can approach some pretty serious issues. You do that by first treating them like human beings. You can’t do any of this in an atmosphere of contempt. You know, in all my years working mainly in men’s prisons, I have never felt threatened once, and when I was herded into a corridor with about 70 general population inmates during a tornado warning, I knew my ‘guys’ would never let anything happen to me. Is learning to make better choices primary over their spiritual growth? I don’t really see any difference. In all of our interactions about spirituality it is about learning to make better life choices, and walk whatever path we choose with more integrity. It is part of what religions entails. In terms of being a Pagan, and as a complete life style, not just an intellectual head game, well isn’t that what we all do? Connecting together the seasons of personal transformation, within ‘Earth’ based religion. We talk about the literal flow of the seasons, but we take what is happening in nature and bring that into what is internally happening with ourselves and our spiritual path In those transformative events, there is trust, and give and take, communication, and a lot of self-reflection. That only comes within a spirit of being able to share who you are. What kind of work do you do within your group? I work with mainly 20 – 40 year olds, and we work always within a ritual circle. Whatever work we plan for that day, we do in that circle. We create that as sacred space, and we consider what we do in there as our sacred work. We may have a lecture, a meditation, a reading, a ritual, or we may just talk. We just finished a ‘lecture’ on ‘what is Wicca?’. The history, and Paganism will be coming up. (Laughs, “It always comes up, “Do you worship Jesus, too?”) They often are asking for some kind of healing work. Typically some kind of energy work. We do a lot of different blessings. Blessings for impending court cases. When people leave we do a special blessing that always ends with “DON’T COME BACK! ”. We sometimes play games and do fun things. We play Wiccan charades, or ‘Wiccan Hangman’ and ‘Wiccan Hangman in Theban’. We have a fantastic energy sensing werewolf game that we play. We may discuss a book or do ritual planning. 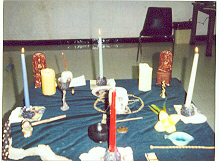 A few weeks before a Sabbat we talk about ritual in general, and what we will do for this one. How does it connect to nature and what is going on inside of us. It may be a full moon or dark moon. These might have some simple spell work within it. We meet once a week for two hours. At one point I had an “advanced” group where you had to pass a written and practical ‘test’ to get in it. We called it the “Dark Moon” group, and we worked on some advanced subjects. We had more continuity because they were all experienced, and we knew they would all be there. The DOC eventually made us disband it, and the inmates who were a part of that say they really miss that. The require all ‘open’ spiritual groups. How do we as individuals and a community learn to give released inmates a chance? Everybody makes stupid mistakes. There are people walking around in every community who ought to be incarcerated and maybe either haven’t been caught or their community ignores their behavior. There are people who need to be locked up for the rest of their lives for their own safety and the safety of others. Some people make mistakes, they serve their time. Our laws say once they have served their time their debt to society has been paid. We have the right to decide if we want those people within our circle of friends, family, or community. I think simply to rule them out across the board, without looking at them as individuals, does both former inmates and ourselves a disservice. There are many people who have come through my various inmate groups that I would not anywhere near me on the outside. I simply would not want them near my friends and family, but that is not true of all of them. There are several that have been in the prison circles that I would be very willing to give them a chance to be trustworthy, within my circle and our community. We have to be clear as both Pagans and human beings what our values and boundaries are. We need to apply those to whomever we allow into our lives, there are a lot of toxic people out there who are not former inmates, as well. Some rehabilitated prisoners have a tremendous amount to offer. Some of the most gifted ritualists I have ever encountered are in prison, and that says a lot. I live in Paganistan, I know a lot of gifted ritualists. It is interesting because we ‘challenge’ each other into our circle a lot in prison. Inmates will not say they enter. “In perfect love and perfect trust”, they will say they enter. “In perfect love and perfect peace”. They say within the prison environment they can’t really be in perfect love and perfect trust, and that is valid. What I tell my students is that reply to a challenge is a declaration of the attitude that YOU bring to the circle, and that you enter expecting that from others. It is not a declaration to be stupid and not pay attention to your own values and boundaries. That is true in and out of prison, that is just being a smart human being. I think we need to re-evaluate how we look at a person in light of their past mistakes. If I had to list all of my past mistakes to enter a circle, maybe you would not stand in circle with me? In the next Pagans in Prison article, you will hear transcribed letters from prisoners, phoned to outside the walls, and my own editorial thoughts.